On the whole the Impressionists tended to favor the clear light of day rather than mistiness and this would generally apply to the work of Sisley but here is an exception in which he attains an exquisite result. It contrasts sharply in treatment and character with his Molesey Weir where everything is boldly defined, and as well as the particular subtlety of color the subject demanded shows a delicacy of brushstroke appropriate to the suggestion of objects taking dim shape through a veil of atmosphere. The faint warmth that is already saturating the vaporous blue and beginning to tint the foreground flowers is beautifully conveyed. The varied informality of brushstroke corresponds to the method of which Sisley expressed his approbation in one of his few observations on painting. He considered that even in a single picture there should be this variety of treatment, adapted to the demands of one passage or another of the work. It is one of the reasons for the vitality of Impressionist painting. If few comparisons offer with the work of other Impressionist masters there is one striking parallel in Monet's Impression of the 1874 exhibition, where his freely and swiftly manipulated brush causes the harbor of Le Havre to take shape in the fog. 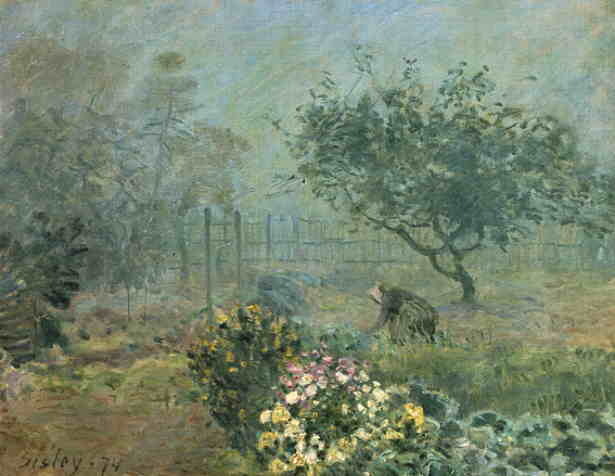 And it is not unlikely that Sisley was influenced by an experimental departure of Pissarro, the Misty Morning at Creil painted the year before Sisley's canvas.